Filtered backprojection, one of the most widely used reconstruction methods in tomography, requires a large number of low-noise projections to yield accurate reconstructions. In many applications of tomography, complete projection data of high quality cannot be obtained, because of practical considerations. Algebraic methods tend to handle such problems better, but are computationally more expensive. In this paper, we introduce a new method that improves the filtered backprojection method by using a custom data-dependent filter that minimizes the projection error of the resulting reconstruction. We show that the computational cost of the new method is significantly lower than that of algebraic methods. 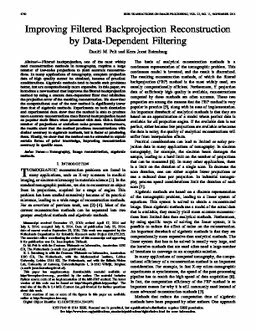 Experiments on both simulation and experimental data show that the method is able to produce more accurate reconstructions than filtered backprojection based on popular static filters when presented with data with a limited number of projections or statistical noise present. Furthermore, the results show that the method produces reconstructions with similar accuracy to algebraic methods, but is faster at producing them. Finally, we show that the method can be extended to exploit certain forms of prior knowledge, improving reconstruction accuracy in specific cases.